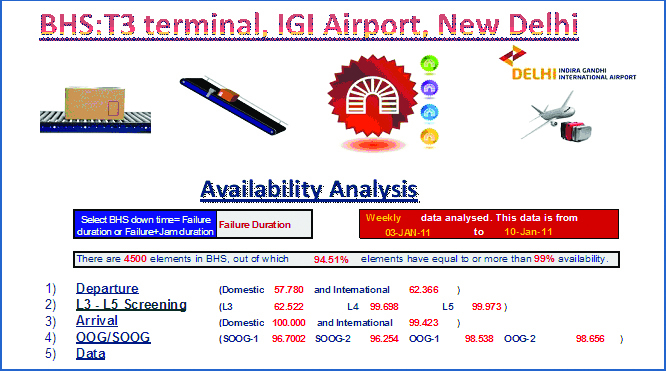 The Baggage Handling System (BHS) installed by Siemens at T3 Terminal, IGI Airport, New Delhi, India was designed to achieve a 99% availability. 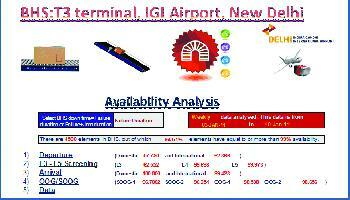 Reliability Centre India analysed the field data of the Baggage Handling System to evaluate the Availability of the BHS. We automated the computation of the Availability performance parameter by integrating it with the BHS diagnostic software and visually displayed the performance. Siemens India contracted Reliability Centre to generate Operation/Maintenance documents for the Baggage Handling System of Delhi Airport Express Line. The Express Line baggage handling system from Siemens will offer passengers an added convenience: travellers to the airport will be able to check their baggage in at the metro stations at New Delhi City Airport Terminal Station and Shivaji Stadium City Airport Terminal Station. There they will be able to pick up their boarding cards, get on the Airport Express and ride to the international airport. Siemens was awarded the contract to supply BHS for the Suvarnabhumi Airport Rail Link, Bangkok, Thailand. Siemens as per the contract shall employ the Railway RAMS process to provide the necessary Quality of Service, Passenger care, comfort and convenience. We managed US $2.3 million project of laying Optical Fibre cable and setting up antennas on Mobile Telephone towers in Malawi and Zambia. We undertook RAMS analysis of BHS system designed by Siemens for their projects in India and Thailand. We have conducted manual testing and auditing of the software. Common problems and software failures encountered in e-governance projects. Home Services About Us Press Site Map Contact Us © 2010 - 2011 Copyright Reliability Center India. All rights reserved.